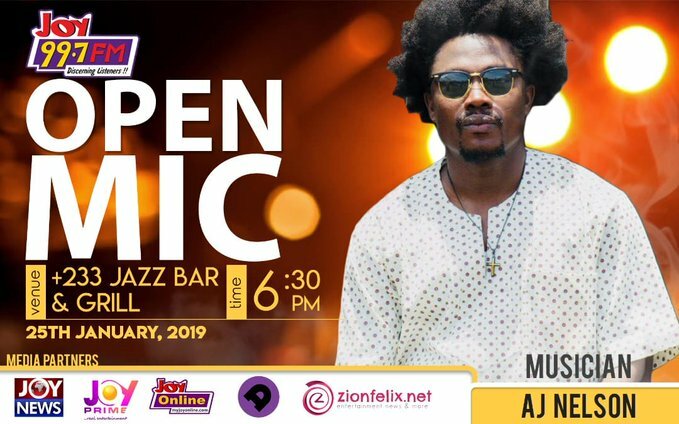 Ghanaian hip-hop, hiplife, afrobeats and jazz performer, AJ Nelson has been billed for the second edition of Joy FM’s Open Mic. Slated for Friday, January 25, the show will host professionals and amateurs in the arts industry in Ghana. AJ Nelson, who recently released his debut album, titled “Africa Rise”, will have the opportunity to thrill hundreds of patrons. Patrons will have the chance to enjoy to some of the top songs off of the album including Apple Music’s favourites; “Kwanto” featuring Cliff Wonder, “Forward” featuring Worlasi, “Africa Rise” featuring Suzz Blaq, “Bibia” featuring Dee Tutu, “Tomorrow” and “Wey Thing” featuring Cabum, De Lion and Lala. According to the organisers, the night will witness exciting poetry, spoken word, comedy, rap battles and musical performances. Other names on the bill this year include talented and bubbly singer Cina Soul, eShun, Six Strings, Lamisi, Kwesi Klutse, Rhyme Sonny, OB Amponsah, Lexi The Comic, Chief Moomen, and Nana Asaase. It will be hosted by Ghana’s number one DJ, DJ Black.